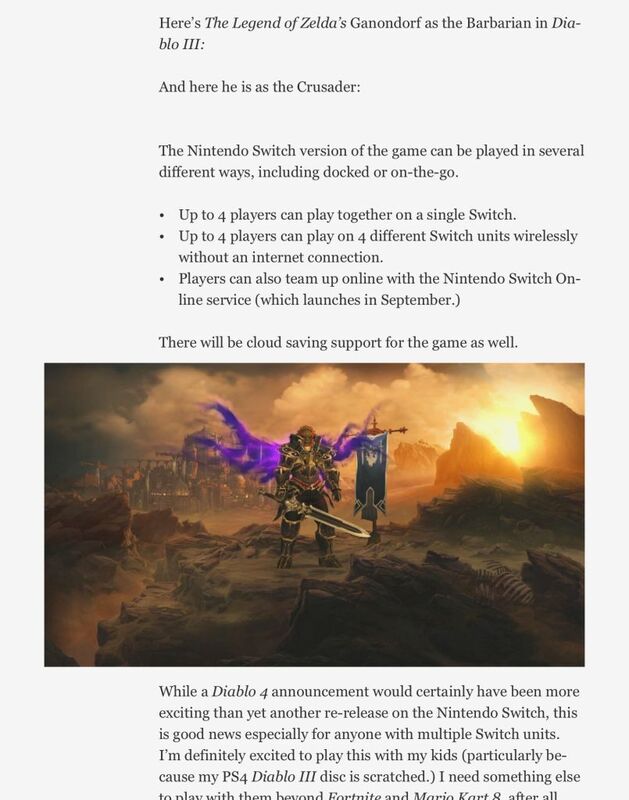 Diablo 3 For Nintendo Switch Leaked Again For Later 2018? The leaks keep on coming for the rumored Diablo 3 for Nintendo Switch. 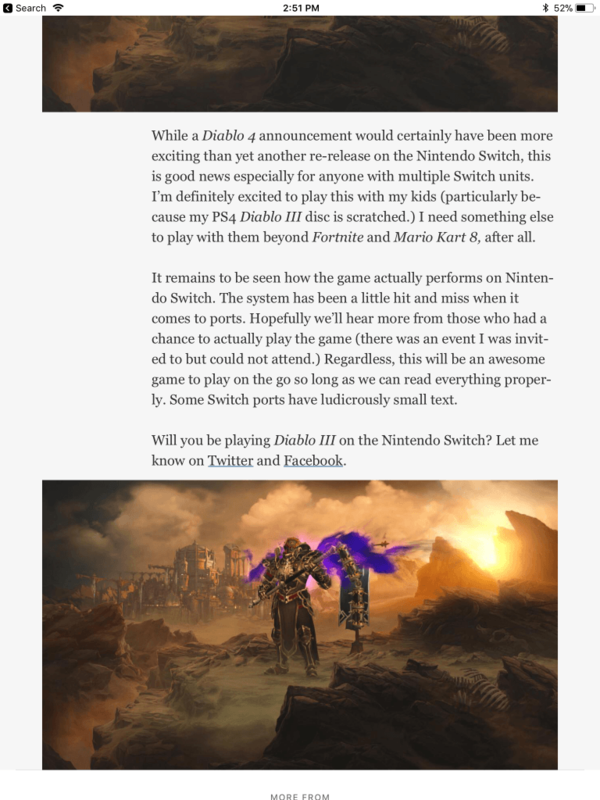 Forbes had released an article supposedly confirming that Diablo 3 for the Nintendo Switch. Since then, the article has been pulled down. But as you know, the internet never forgets. A user on Restera took a screen cap of the article and is now out to the public. So if this article has any truth in it, the game is slated to be in later 2018 at the MSRP of $59.99. 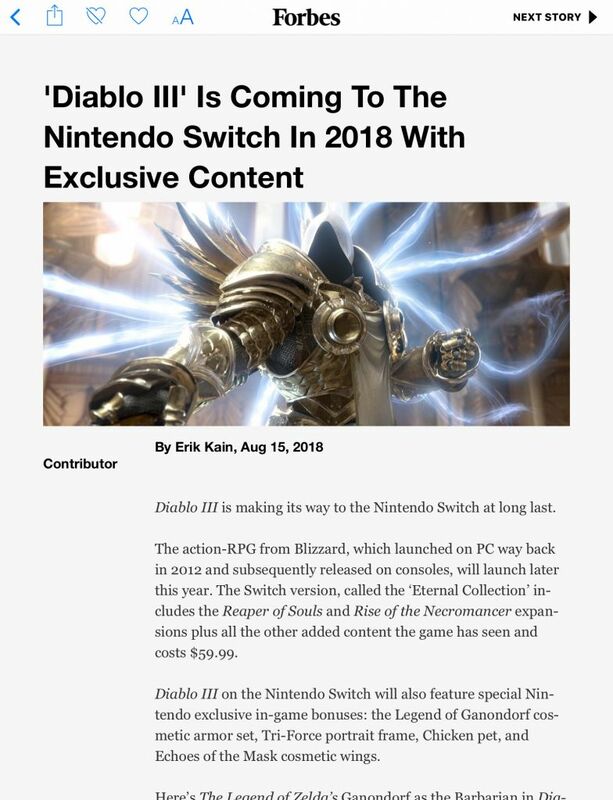 The Nintendo Switch version will also be called Diablo 3: Eternal Collection. This will include the Reaper of Souls and Rise of the Necromancer Expansion packs. What will be exclusive for the Nintendo Switch version is that it will have a Legend of Ganondorf cosmetic armor set, Triforce portait frame, a Chicken pet (Cucco if we are sticking to the Zelda theme) , and a Echoes of the Mask cosmetic wing. It also says that the game can be played in both handheld and docked mode. Other features noted is that ” 4 players can play on a single Switch”. Is this meaning local couch co-op is here? “4 players can play on their own Nintendo Switch units without the use of a internet connection”. This can be good though I wonder if performance will be affected. It also details that it will utilize the Nintendo Online service that is scheduled to release in September and will have cloud save. This seems to be specific details for the game, but until Nintendo or Blizzard confirms this themselves, we can only call this a rumor for now. The natural questions are: How will it run? Will it be 30 or 60 fps? Will it be stable? and many other questions. We will update as this story develops.